Julie Powell is 30 years old, living in a tiny apartment in Queens and working at a soul-sucking secretarial job that's going nowhere. She needs something to break the monotony of her life, and she invents a deranged assignment. She will take her mother's worn, dog-eared copy of Julia Child's 1961 classic Mastering the Art of French Cooking, and she will cook all 524 recipesin the span of one year. At first she thinks it will be easy. But as she moves from the simple Potage Parmentier (potato soup) into the more complicated realm of aspics and crepes, she realizes there's more to Mastering the Art of French Cooking than meets the eye. And somewhere along the line she realizes she has turned her outer-borough kitchen into a miracle of creation and cuisine. She has eclipsed her life's ordinariness through spectacular humor, hysteria, and perseverance. 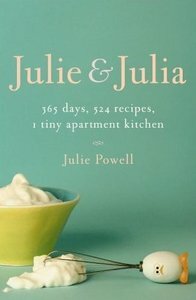 Julie Julia is the story of Julie Powell's attempt to revitalize her marriage, restore her ambition, and save her soul by cooking all 524 recipes in Julia Child's Mastering the Art of French Cooking, Volume I, in a period of 365 days. The result is a masterful medley of Bridget Jones' Diary meets Like Water for Chocolate, mixed with a healthy dose of original wit, warmth, and inspiration that sets this memoir apart from most tales of personal redemption. Powell is a natural when it comes to connecting with her readers, which is probably why her blog generated so much buzz, both from readers and media alike. And while her self-deprecating sense of humor can sometimes dissolve into whininess, she never really loses her edge, or her sense of purpose. Even on day 365, she's working her way through Mayonnaise Collee and ending the evening "back exactly where we startedjust Eric and me, three cats and Buffysitting on a couch in the outer boroughs, eating, with Julia chortling alongside us."